Paper is still the main material used in insurance and financial activities. For this reason, we are committed to introducing increasing numbers of measures to reduce the consumption of both white paper and printed paper. In 2013 our companies consumed 61,313 hundred kilograms of paper, -6.2% compared with 2012: this means that in the space of a year we managed to save around 77,000 trees. The reduction in consumption achieved in recent years has been possible thanks to various initiatives, such as the standard practice of printing on both sides of the paper, the replacement of individual photocopiers and fax machines with multifunctional machines or centralised printers for the office/floor, and the reduction of internal paper-based correspondence. In many agencies policies are only printed when taken out, with the elimination of pre-printed forms, and policy conditions are available on the company websites. In addition, for communications between companies, agencies and clients, attempts are being made in all countries to switch to alternative systems to paper, such as email and text message. Where possible we try to encourage our employees to scan documentation relating to various types of request (reimbursements, absence request forms, etc.) and to send it by email or upload it in special areas in order to avoid pointless print-outs. In Italy, a working group evaluated the feasibility of evolving the process of selling insurance products using tablets and graphometric signatures. The project will be limited in scope initially but we plan to extend it to all Italian companies by 2015. One of the advantages of sales via tablets is the fact that the agent/salesman remains the main channel for accessing the company’s services, but the pre-sales, sales and payment phases all take place in a single visit to the client with the complete elimination of paper (thanks to the digitalisation of the documents). Thanks to this system, from 2017, 35 million sheets of A4 paper (160 hundred kilograms) will be saved in Italy, the equivalent of 3,000 trees a year and 1,000 tonnes of CO2. The electronic storage and digitalisation of documents is increasingly widespread in the various areas of the business activities, with benefits in terms of both the accessibility and the security and confidentiality of the documents. Thanks to electronic storage, in 2013 savings of almost 315 million sheets of paper were made. We are also committed to increasing the amount of ecological paper as a quota of total paper consumption, which in 2013 exceeded 90%. Currently, 100% of the paper purchased in Austria, Spain and Switzerland is certified as ecological as it satisfies the criteria established by national and international certification systems. In Austria, in particular, paper made with the cellulose of the eucalyptus tree is used, a tree that grows very quickly and absorbs a lot of CO2. In addition, where possible we purchase paper with a lower than normal unit weight, equal to 75 g/m2, with additional savings in terms of the natural resources employed even if the current consumption rate in terms of sheets of paper remains the same. 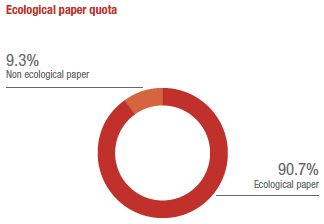 As well as ecological paper, the Group companies also use a small quantity of recycled paper, equal to 4.9%. As well as ecological paper, we are also committed to purchasing stationery and toner with low environmental impact. Indeed, many countries have a catalogue of ‘green’ products which includes, for example, solvent-free pens with water-based ink, pencils made with wood from sustainably managed forests, and toner produced with recycled and/or regenerated materials. In 2013, we purchased 695 hundred kilograms of toner cartridges, of which 13.7% were regenerated and 9.3% recycled. In this context, the network of Alleanza agencies in Italy is equipped with EcoBoxes, boxes provided directly by the toner supplier who manages the delivery and collection of the boxes and the refilling of the cartridges. The majority of the measures described above have had positive effects on paper consumption as well as toner and energy consumption. This reduction in consumption can be added to the reduction resulting from changes already made or ongoing with regard to the real estate assets of the Group.